From left to right: Laura Hoefs, Pam Foelske, Betsy Lewis, Cheryl Mueller and Debbie Parrington. 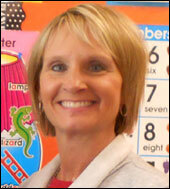 Pam Foelske has been teaching at Batavia Nursery School since 2001. She became a Batavia Nursery School Co-Director in February 2016 and Director in January 2019. She has a Bachelor's degree from Wartburg College, and taught Kindergarten, Pre-Kindergarten and was a substitute teacher in the Batavia School District for 7 years. She is an alumni parent, as all three of her children attended BNS. 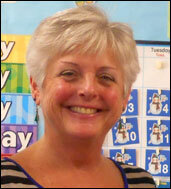 Betsy Lewis was a Batavia Nursery School Co-Director and has been teaching at Batavia Nursery School since 1999. She has a Bachelor's degree from Glassboro State College. Prior teaching experience includes substituting in elementary schools and teaching art to 3- to 12-year-olds. Cheryl Mueller has a Bachelor's degree from Lewis University. She taught 1st grade and coached both volleyball and softball at Riverside-Brookfield High School before becoming a stay-at-home mom when her children were young. She and her husband live in Batavia and have two daughters and a son who attended BNS when they were preschoolers. Cheryl began subbing for BNS and teaching Enrichment classes prior to being hired as a teacher in 2007. Debbie Parrington is the mother of two BNS alumni. She has a Master's degree from National-Louis University and has been a long-term sub at several elementary schools in Batavia and Geneva. She has also tutored students from Kindergarten to eighth grade. Debbie began subbing for BNS and teaching Enrichment Classes prior to being hired as a teacher for the 2009 school year. Laura Hoefs joined BNS in August 2016. She has a Bachelor's degree from the University of Iowa. She fell in love with Early Childhood education when she began teaching with Head Start. She has also taught Enrichment classes, has experience with Pre-Kindergarten students and is a BNS alumni parent.